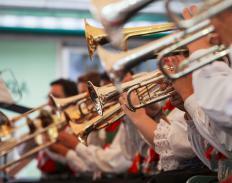 What Is a Brass Band Festival? Brass band festivals celebrate brass instruments and ensembles. A brass band festival is a celebration of music that showcases brass band ensembles. In general, an ensemble that features brass instruments, woodwinds, and percussion instruments can be considered a brass band. Usually, the music presented at a brass band festival includes a variety of different styles and sounds. Many such festivals also include other activities for people to enjoy. The purpose of a brass band festival is not only to entertain but also to educate. Toward that end, these types of festivals often showcase a variety of brass bands that play different styles of music. For instance, one band might have a traditional marching band sound and repertoire, while another might have a jazzy, New Orleans style. No two brass bands are ever exactly alike, and each one will have its own unique sound and style. This is a point that is often illustrated quite effectively and enjoyably at a brass band festival. Like most festivals, a brass band festival will usually have other activities available to entertain guests. Aside from a variety of brass band concerts, most festivalgoers will also find a variety of food, beverage, and craft vendors Some festivals might also offer educational seminars and lessons regarding brass band history and the different types of brass instruments. Brass band competitions might also be held. There could also be children’s activities available to entertain the younger set, such as bounce houses, games, and kids' crafts. Festivals involving brass bands have been held for centuries. In fact, the first brass band festival might date back to the early 19th century. In the 1800s, during the British industrial revolution, brass bands developed as a form of recreation and entertainment for workers and laborers. The ability to skillfully play brass instruments quickly became a source of pride and competition among the working class, and communities would often gather to listen to and determine which musicians were the best at playing. This tradition carried over and likely gave rise to what most people recognize today as a brass band festival. While the specific instruments might vary, traditional, or British-style, brass bands typically have 28 players and include cornets, trombones, flugelhorns, and euphoniums. In addition to brass instruments, a brass band generally includes woodwinds, such as clarinets or flutes, and percussion instruments, such as snare drums, cymbals, and glockenspiels. Many standard brass bands have 25 rather than 28 players and include saxophones, tubas, and bugles. Whatever variety of instruments are chosen for a particular brass band, the distinguishing feature is the absence of string instruments. What Are the Different Uses of Brass? What Is an Orchestra Festival? What Is a Marching Band Festival? How Do I Prepare for a Percussion Competition? There is an amazing brass band festival in San Diego every year. The beautiful weather makes for perfect festival weather and I have spent many pleasant nights sipping a beer and listening to some great brass band music. I just checked the festival website and it says that this year's lineup is larger than ever. They have actually added an extra day. I am glad to know that the great art of the brass band is alive and thriving. There is a brass band contest in Chicago every year. There are probably a dozen different bands and each one is judged on a series of performances. At the end a winner is chosen and they get a pretty substantial cash prize. The music never fails to be incredible. Since there are real stakes the musicians play their hearts out. I have loved brass band music ever since I was a child. I picked up the trumpet at a young age and the music of the brass band has been with me ever since. I am not in a band now but I go to a brass band festival every year. It is one of my favorite weekends of the year. They have some amazing players that come out. And the energy, oh the energy. That is what I always loved about brass band music. You feel like you could march casually up the side of a mountain when you are listening to it.